On Saturday afternoon, August 4, there was a drone attack, evidently aimed at killing Venezuelan President Nicolás Maduro, in Caracas, the Venezuelan capital. Maduro was reviewing the country’s National Guard on the occasion of its 81st anniversary. He was expected to give a speech which, among other things, would have dealt with the severe inflation and shortages the Venezuelan people have been facing. At around 5:00 pm, several drones later found to be armed with C4 explosives appeared overhead and a number of loud explosions occurred. According to local sources, military snipers had shot down two of the drones. 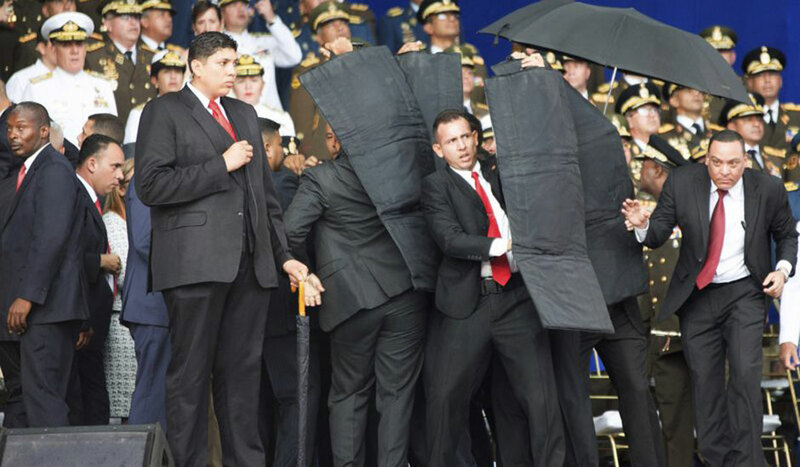 Maduro and people standing with him on the podium were not harmed, but seven soldiers were injured. There were reports of damage to a nearby apartment building, and at least one possible civilian injury. Video clips show bodyguards moving to defend the president, his wife, and aides, while soldiers and civilians on the street below took cover. 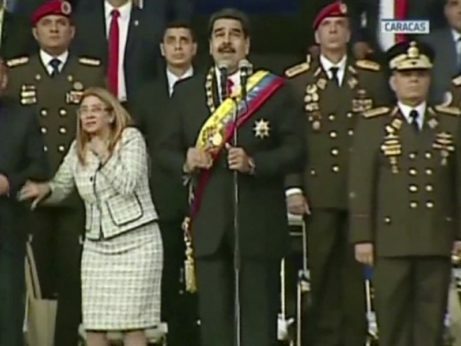 Although the planned speech was cancelled, shortly thereafter Jorge Rodríguez, Venezuela’s Vice Minister for Communications, confirmed details of the incident and reassured the public that Maduro had not been injured. Later, the president himself appeared on television and blamed the incident on right-wing forces in Venezuela, neighboring Colombia, and beyond. An anti-government organization styling itself “Soldiers in T-Shirts” claimed credit for the attack through Twitter messages. The identity of the group and its members is not clear, but they threatened to carry out more terrorist attacks against Venezuela’s Bolivarian government. Last year, a dissident military officer, Oscar Pérez, commandeered a helicopter and used it to drop hand grenades on Venezuela’s Supreme Court building. 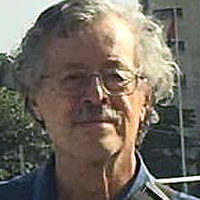 Pérez was killed in a shootout with police in January of this year. Some on the right hail him as a hero. Naturally, many immediately suspected that U.S. President Donald Trump’s administration might have had a hand in the attack, but National Security Advisor John Bolton immediately denied such a possibility. This reassured very few, however; the hostility of the Trump administration to Venezuela has been evident from the start. The possibility of Colombian involvement, whether by the present government of Santos or people close to the incoming government of extreme right-winger Ivan Duque, who won Colombia’s presidential elections in June and will be inaugurated on August 7, is similarly conceivable. Duque is allied with former president Alvaro Uribe, who has made no bones about his wish to overthrow Maduro and other left-wing Latin American leaders. On Sunday, August 5, one day after the drone attack, Uribe, talking to a group of U.S. businessmen, issued a call for the Venezuelan military to overthrow Maduro via a coup d’etat and called for U.S. business interests to support such a violent act. A year ago, Trump evidently asked his advisors why it was not possible for the United States to invade Venezuela to overthrow its government, according to sources within the administration. Press reports concerning the president’s inquiry said Trump’s advisors tried to dissuade him from that idea, pointing out the negative reaction such a move would produce throughout Latin America. However, it is clear that the current administration has stepped up efforts, begun under former President Barack Obama, to change the Venezuelan government for one more favorable to U.S. economic and geopolitical interests. Harsh sanctions have been placed on Venezuela and Venezuelan officials which make it difficult to repatriate profits from the CITGO chain of gasoline stations in the U.S., which are owned by the Venezuelan national oil company, or to get international development credit. Instead of invading Venezuela, the plan is to disrupt its economy so thoroughly that the Venezuelan people will rebel and throw the Maduro government out themselves. This is the same strategy the United States pursued, without success, against socialist Cuba for decades. Meanwhile, Venezuelan security personnel moved fast to go after those accused of having engineered the drone attack. Police arrested six individuals, who at the time of this writing have not yet been named. According to Venezuelan Interior Minister Nestor Reverol, the arrests came after raids on several hotels in Caracas. Reverol revealed that two of those detained had prior records related to their roles in the violent “guarimba” riots in 2014. On Monday, August 6, thousands marched in the streets of Caracas to denounce the drone attack and express their support for Maduro’s government. Governments and organizations in Venezuela and beyond indignantly denounced the attack and its perpetrators.